As a non City and Guilds course, the PAT Competency course instead offers practical training elements alongside theory to ensure that learners leave with confidence in their ability to practically carry out testing using the equipment, as well as put into practice their theoretical knowledge. There are opportunities to practice testing on real equipment in real situations under the guidance of an experienced and professional tutor. All successful learners will also be able to carry out PAT testing work and keep records of their results effectively. The assessment consists of a 20 question on-book exam taken after the theory modules are complete. Those who pass the course will be awarded with a Certificate of Competence in PAT testing. The course starts at 9.00am and finishes at 16.00. It is one day long in total. The South London location is easy to reach from Brighton and the South Coast, Bristol and Bath in the West and Northern and Central London. Anyone required to maintain electrical appliances in a work place would benefit from this course, as would those wanting to begin a career or set up their own PAT testing company. 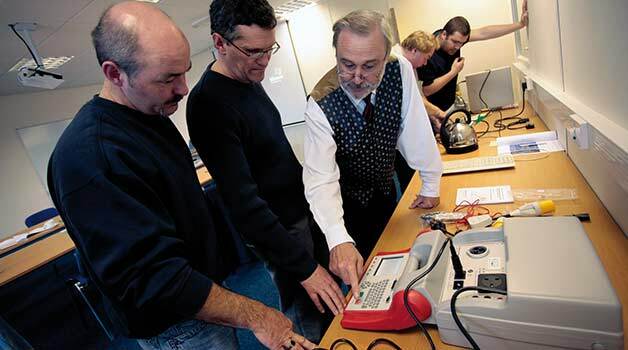 It is ideal for people who want training in PAT testing in order to prove their competency to carry out the work and who want practical PAT instruction alongside theoretical training. There aren’t any pre-requisites for the PAT course except that learners must be interested in the subject and be willing to learn. We recommend that learners purchase and familiarise themselves with the Code of Practice to ensure they are fully aware of the requirements, and to keep it handy as a useful tool throughout their career in the PAT industry. Our Surrey PAT Testing Competency Course combines the theory and practical aspects of PAT testing.